To shower or not to shower? It’s a daily question. But, as far as science is concerned, it shouldn’t be. The truth is we shower too much. 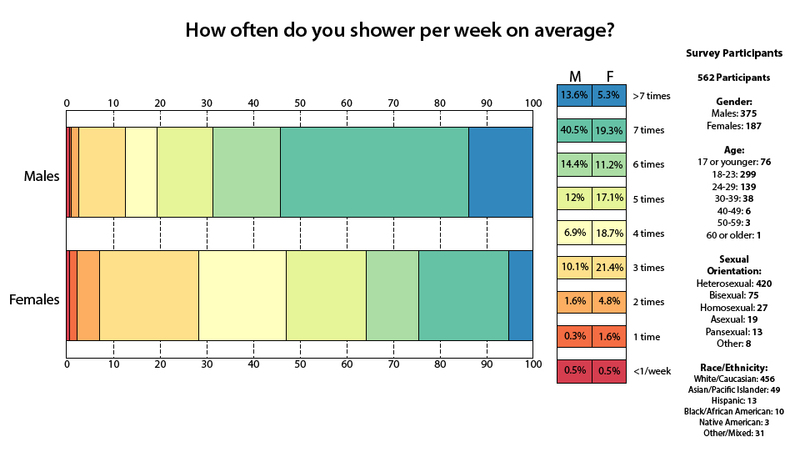 A curious Reddit user recently polled over 500 people and found that 54.1% of the guys showered at least once a day. Of course, a Reddit poll is rather unofficial, and conflicts with other surveys that found only 46% of men wash their faces. Dr. Ranella Hirsch, a Boston dermatologist, says, "We over-bathe in this country. That's really important to realize. A lot of the reasons we do it is because of societal norms." And according to Dr. C. Brandon Mitchell, a professor of dermatology at George Washington University, two showers per week is all you need: “Your body is naturally a well-oiled machine. A daily shower isn’t necessary." Here's what happens if you shower every day. The hot water dries out your skin and removes essential oils, irritating it. You also wash off good bacteria that protects your skin from infection. The same goes for your hair. You only have to wash it about twice a week, for similar reasons. Washing your hair everyday dries it out and makes it frizzy. It also removes the essential oils that give you those good hair days. If you're looking to take your hair game to the next level, we've got you covered. So unless you’re going to the gym everyday, you can skip your daily shower. Two or three times a week is good. On your off days, take a tip from Brad Pitt. When Eli Roth, Pitt’s co-star in Inglorious Basterds, showed up a little stinky to set, he told him to up his baby wipes game. Pitt said, “I got six kids. All you’ve got to do is just take them, a couple quick wipes under the pits. “Man, I’m getting [peed] on all day. I don’t have time to take a shower.” We would obviously suggest DUDE Shower body wipes instead of baby wipes (C'mon Brad). But don’t take this advice to the extreme. I’m not saying you should go all Pig-Pen, looking like Forrest Gump after his cross-country run. Or like Dave Whitlock, a chemical engineer who hasn’t taken a shower in over 12 years. This kind of hygiene regimen is positively prehistoric, when the ancient Greeks had servants to pour water over them in communal showers. Guys, don’t be like David Whitlock. So there you have it, the choice is yours. You can take a shower every two or three days and let your manly essence take care of the rest. You’ve got science, Brad Pitt and DUDE Shower body wipes to back you up.